Don’t be put off by this book having December in the title, it’s not a book that you need to wait till then to read. What is more important is that it is set over the course of one day – that day just happens to be in December. And what an action packed, emotional day it is. I adored this book. I loved the format of the way the story unfolded. It takes place, as I said, over the course of one day where we follow the four characters in blocks of two hours leading up to midnight. Each character has a chapter in each section of time so we hear from each what is happening. The characters are all loosely – or not so loosely -connected and of course the reader knows more about the connections than the characters. I was slightly daunted by the large list of characters at the beginning of the book but actually, there are probably no more than in any book and I certainly had no problem keeping up with who was who. I found this a really compelling book. Because we hear from each character in turn in every section, I was always desperate to find out what was going to happen next for them. Particularly as the time crept towards midnight, it was a bit like watching the end of thriller film – it was fascinating yet I almost wanted to hide my eyes as the four storylines inevitably came together. There were lots of interesting threads to the story and I definitely empathised with some of the characters more than others! Towards the end there were some emotional scenes which were perfectly narrated. 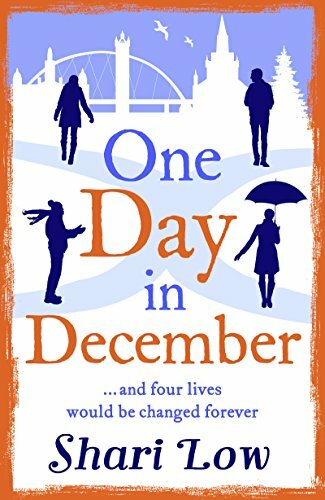 One Day in December is a wonderfully written story which I certainly found hard to put down. It’s a perfect mix of romance, relationships, friendships and secrets. It will make you laugh, it might make you cry and the characters will definitely stay in your mind. In fact, I’d really love to find out what happens next for them. It’s a book to curl up with as the darker nights draw in but don’t wait until December! It’s the first of Shari Low’s books I’ve read and I’ll definitely be looking out for more from this accomplished storyteller. Thanks Cleo, really enjoyed it. Check out One Day in December, by Shari Low, as featured on the Portobello Book Blog.